I want to share with you the story of my life. It is amazing how much I have changed. I never would have been caught dead with my dear friends at a young age. I was too proud and would have been ashamed to be seen with them. You should have seen me when I was first made. I was truly a work of art. You could not find a single flaw on me. In fact, several people looked for flaws and when I was deemed flaw free I was moved to my first real home. I have had only a few homes in my life, but the one I currently live in is the most rewarding. My first home was a department store, which I think is an appropriate name. Everyone that lives there is waiting for their chance to depart. I happened to be the cream of the crop, so I was only there a short time. I was the latest fashion. I was what everyone wanted and I was sold at a premium price. And I knew it. I was originally sold for 150 Pounds. I was better than the clothes that were marked down, even 20% off. I wouldn’t talk to those that were on final clearance. Once they wore the red tag they were the least in the store. I had nothing to do with them. They were not in the same class as I. My second home was a step up. I spent most of my time in a closet, with friend that were mainly from the same class. We would talk about our days in the department store and compare how much we were sold for and how much time we spent there. We made fun of the clearance clothes. When one of us would leave for the day the others would anxiously await to hear what their day held. I must admit that at times I was filled with envy. I don’t have time to share with you my whole life, but I was able to go to Paris, Prague and New York among other places. I was sprayed with expensive perfumes and washed by hand so as to maintain my beauty. Then, things started to change. I spent more and more time in the closet. I would be pulled out and placed on my owners body and I would just start to feel at home when I would be removed and sometimes even thrown on the floor. One day, I was placed in a plastic bag with some of the other clothes. We had no idea where we were going. The bag opened and the first thing I noticed was the smell. I no longer smelled the expensive perfumes. I don’t know how to describe the smell. Dank? Old? Dirty? We were all thrown into a pile and left there. I don’t know how long I was there. You lose track of time when the closet doesn’t open everyday and there are no stories to be told. Eventually, I was placed on a wire hanger and put out with some other clothes. This was probably the hardest time in my life. The ticket that was on me said $5 and I was passed over many times. How had I become so worthless? Didn’t they know who I was? You should have seen the shirt next to me. She had stains on her and even a few hole. At first, I would snub her attempts to talk, but I became lonely and with time we became friends. Her story was so different than mine, but I really began to appreciate her for who she was, not judge her by her looks. One day we were all thrown into boxes. We spent time on a ship. Talk about close quarters!!! Eventually, we were disembarked at a place called Ja Booty. I am not sure why anyplace would be named after a body part. And who is Ja? I was in a whole new land. I couldn’t understand what people were saying. The smells were all different. Nothing was like at home. We went on a long truck ride to Ethiopia. I was first brought to Addis Ababa. Apparently, it is the largest market in all of Africa… Merkato. I was only there a short time before I was shipped to Shashemane, Ethiopia and then brought to Soddo, Ethiopia. It was nothing like I had ever seen before. I was no longer placed on a hanger to be sold, but I was put on a potato sack in a pile of clothes. The potato sack sat in the mud. I was priced at 10 birr (57 cents), talk about a blow to my self esteem. I was not sold, but was stolen. What kind of person would steal? Who was this new owner? My new owner was young and a male. Didn’t he know I was a shirt for girls?!? Sometimes he told people he was 10. Other times, he said he was 14. I don’t think he really knows. We spent all of our time together. During the days, we go to the market and carry things all over town for the shoppers. Other days, the bus station. I really began to love him. I haven’t met his mom or dad or siblings. He talks about them, but I haven’t met them. And he always tells a different story. All the stories are sad. Who knows what is really the truth. When there isn’t much work, we sometimes play ping pong, but it is a rare treat because it cost money. I frequently am showered in crumbs from bread because that is the only food he can afford. He sometimes steals things, and then he is able to eat more than bread. About once every month, we go to the river and he pounds me against a rock and try to get all the dirt out. I have holes. My colors have faded. My seams were now anything but perfect and have become the home of bugs. At night, we sleep on the side of the road. During the rains, we get soaked and he shivers. More than anything I just want to keep him warm. He has a best friend and at night they cuddle to try to stay warm. His best friend sometimes wets the bed, so I get wet. Some nights we were under a box or potato sack. Other nights, it was just us. I smelled bad. I am infested with bugs. I am faded and covered in holes. And I have never been more treasured. I know my time as a shirt is limited. I cannot tell you how proud I am to be owned by a thief. I would defend him any way I possibly can. Around town, I have seen shirts from the Dodge City, KS marching band, Hays, KS High School, Michigan State and Michigan University shirts, Pokes sweatshirts, Vikings shirts… One shirt was a seahawks shirt. I like to think it is from the Garden City Seahawks swim team. I obviously, do not know how they all got here, but maybe this is their story. 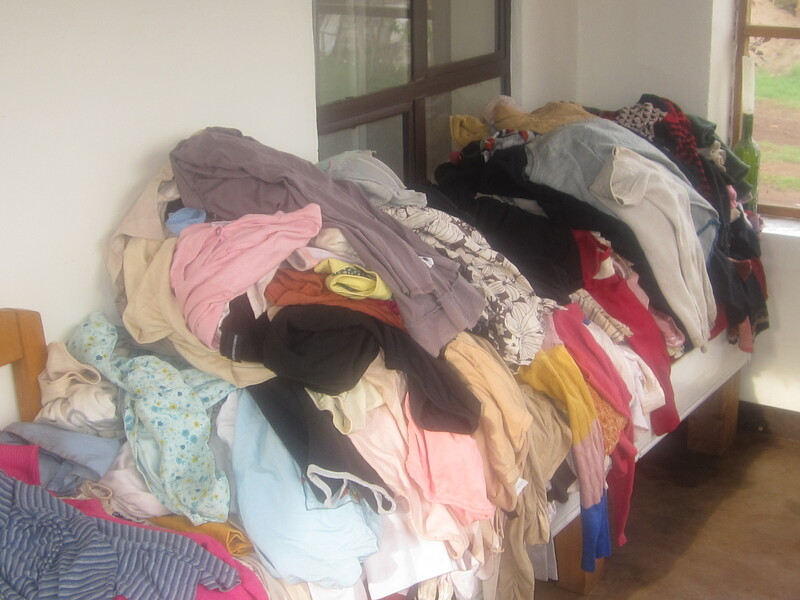 Today, I went to the market and bought over 200 jackets, sweaters, sweatshirts and shirts. I haven’t bought any clothes for the kids for about 5 weeks because so many show up. How do I clothe 100-150 kids? The rains have started and so many have been asking, no begging, for warm clothes. The shirts tomorrow will be in the hands of thieves, and soon be filled with holes, covered in body lice, stink and be faded. Thank you for helping me clothe the beautiful street kids of Soddo. I am honored to do so. Thank you for all you do as well. Beautiful, poignant story, Stephanie. Thank you.